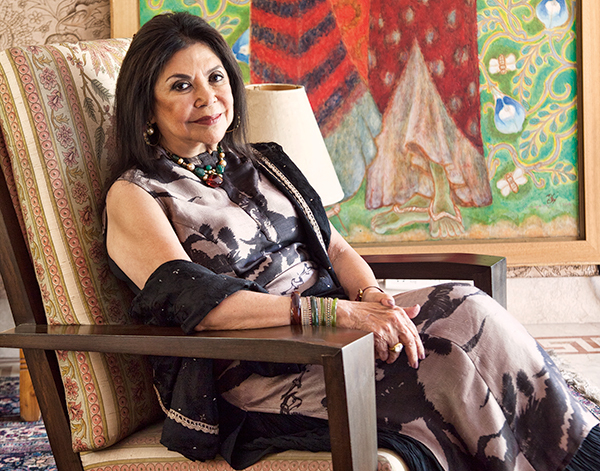 Spearheading India’s sartorial revolution at a time when British wallpaper designs were replacing zardozi and artisans were losing the power to weave magic on their looms, Ritu Kumar has continuously reinstated the country’s textile heritage. What started out as a small set-up in a grocery store during the ’60s has now diversified into evening wear, textile design and revival, and very recently even a new label that caters to a younger audience. 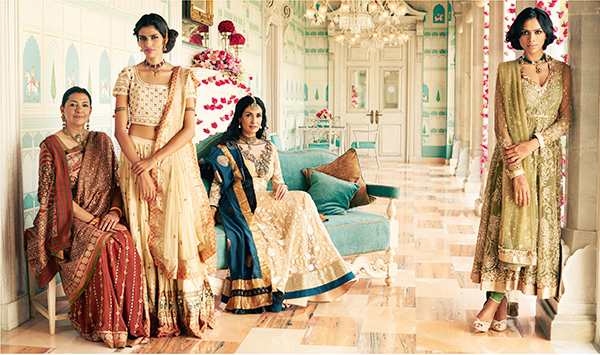 But one aspect that stands tall as the epicentre of all her work is her contribution to bridal wear. “I did a project of zardozi revival at a time when it wasn’t available in the country and the art had almost died. 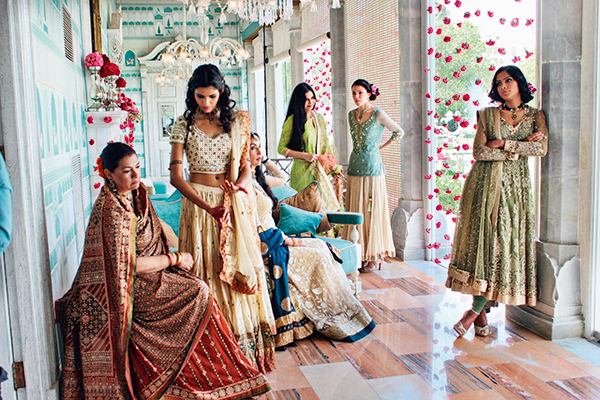 And bridal wear was nothing but traditional attires. You would get bandhini saris in Rajasthan, gota work in Punjab and of course the Benarasi saris in Varanasi. Apart from a smattering of clothing and textiles, there was not much available, and a lot of us got married in our moms’ old saris. There was no customisation, nothing bespoke…I remember when I was getting married, I was looking for old Benarasi saris as I could not stand the new ones that they were making. So to my own (evening) wedding, which was celebrated through a small Vedic ceremony, I wore a red bandhini sari with pure gold aari work that my mother-in-law insisted on. That sari has stayed with me and even though the times have changed, fundamentally nothing has been tweaked in terms of the aesthetics of that style of sari and it can be easily passed down to the next generation,” she says. Flipping through the pages of her past, she fondly recalls some tales from her familial history, “In the ’70s, I designed my bhabhi’s wedding outfit by absolute accident because the ceremony was planned very quickly and she wanted to wear a lehnga contrary to the norm which was wearing a salwar kameez with a chunni. I remember working on a long 36 kali ghaghra with fine aari work on it. That was the first time I created a lehnga of that stature,” she adds. Expanding her expertise in this sphere, Kumar has designed celebrity bridal outfits and in one case revived it too when she put her master craftsmanship to work to recreate Sharmila Tagore’s antique, traditional joda — passed down by her mother-in-law, Begum Sajida Sultan of Bhopal, who wore it for her wedding in 1939 — for Kareena Kapoor Khan. This traditional bridal attire consisted of a kurta, Farsi pyjama and dupatta made of rust and gold tissue with soft green satin gota at the hem. The neckline, sleeve-ends, hem and side slits of the knee-length kurta were all decorated with a zardozi border. While recreating it, the weaving and embroidery were done in the likeness of the original by master artisans. The original odhni — from the last century — was repaired to form the final part of the ensemble. The whole process of recreating and modernising the family’s heirloom took almost four months. Kumar’s outstanding skills and dedication towards revival stems from her personal pursuit of classic woven Benarasi saris at one time. “Sometime around the ’60s, in the lanes of Amritsar, by great luck I found somebody with a trunk of old Benarasi saris of an ilk I never saw again in my life. Everything today has become metallic — it is not just a young person who wouldn’t take a liking to it, but someone my age would not enjoy wearing it either. The designs have wavered from an essential balance of gold and silk to everything being overtly bling; part of the reason is the Chinese yarns that the weavers are using, which result in stiff saris. Then of course, with real gold becoming very expensive, they started using some plastic substitute instead and are producing over-designed fabrics. It’s like going from very good to very bad architecture. India has an amazing textile aesthetic; you cannot push something that is not up to a standard down people’s throats. So I am trying to revive that quality,” adds the textile maven. 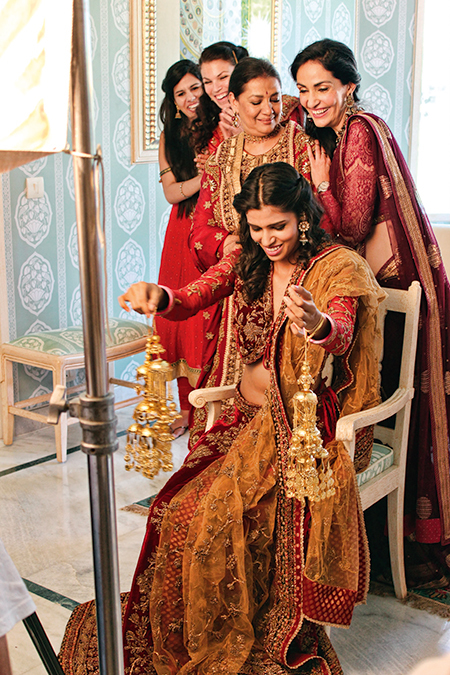 Creating a design directory of her own — which takes influences from the West — she has recently branched out into a younger palette of colours with lighter lehngas for the modern bride, who, Kumar feels, must not let her clothes overpower her personality. Today, as she moves forward by leaps and bounds, serving zardozi, gota and a plethora of other hand-spun designs, she neatly ties comfort and ease with pomp. And perhaps to the spectators, her creations resonate with opulence but for the women who have dressed themselves in her designs, over the years, it is understood that these pieces will remain infinitely precious.